Orthodox Church liturgical Bishop clergy vestments (yellow-gold) by Istok Church Supplies Corp. Looking for resplendent Bishop Vestments? 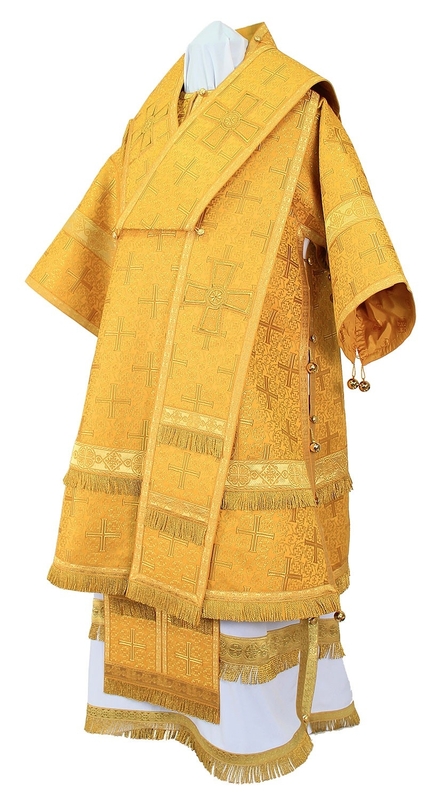 Istok Church Supplies has a broad collection of rich and comfortable Orthodox Christian Bishop Vestments in yellow and gold that will serve the needs of the wearer and the church community he serves. Yellow is often worn by Orthodox Christian clergy members for Sundays and feasts and days honoring Our Savior Jesus Christ, Apostles, and Holy Hierarchs. The combination of yellow and gold is a particularly potent one that’s sure to inspire and instill spiritual fervor in both the wearer and everyone who sees it. We offer yellow and gold Bishop Vestments in a variety of plush and durable fabrics namely rayon jacquard brocade, metallic jacquard brocade and natural German velvet. We aim to provide Bishop Vestments that are affordable, durable and dignified. Our traditional Bishop vestments consist of eight items - sakkos, belt, epimanika, epitralhilion, sulok, small omophorion, large omophorion and epigonation. We provide natural rayon lining and natural velvet inserts for maximum comfort. Customers can add matching chalice covers and a veil to their order if they desire these items. From the choice of fabric to the type of decoration, we provide plenty of options for customers to customize their orders according to their aesthetic preferences, church needs and budget allowances. We love offering one of a kind, custom tailored Bishop Vestments in yellow and gold that adds glory to the wearer and to God Himself. We are dedicated to helping Orthodox Christian church communities preserve and grow their time honored traditions. Our ecclesiastical tailors in Europe understand Orthodox Christian canons related to liturgical garments and are highly skilled in rendering perfectly fitting outfits that would be stylish additions to any respected Bishop’s wardrobe. Of course, a good fit depends on the measurements provided by our customers and we take this opportunity to request you to use our measurement chart and send in your exact details. Wherever you are in the world, shop from our vast collection of traditional, affordable and durable Orthodox Christian Bishop vestments!